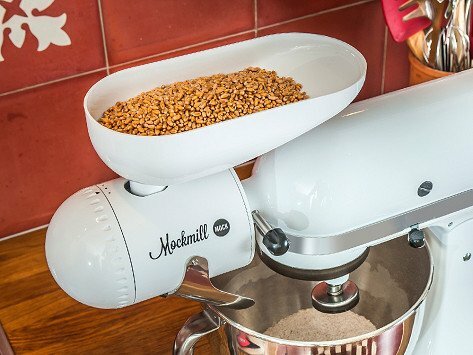 With a home grain mill attachment fitted onto your stand mixer, it’s easy to whip up your own fresh flours. 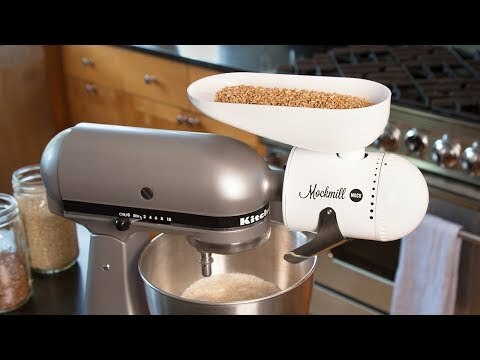 Ceramic milling stones make quick work of wheat, rye, quinoa, and other grains—and 11 milling grade settings let you get precisely the texture you like, from coarse meal to fine flour. Dimensions: 4.1" x 7" x 10.63"
Wolfgang invented a mill attachment that works with many common stand mixers, and he also created a countertop-friendly self-contained mill. Ceramic milling stones do all the hard work for you and variable settings let you choose the precise texture you like, from coarse meal to finely ground flours. And once you taste the fresh stuff, you won't want to go back to store-bought.